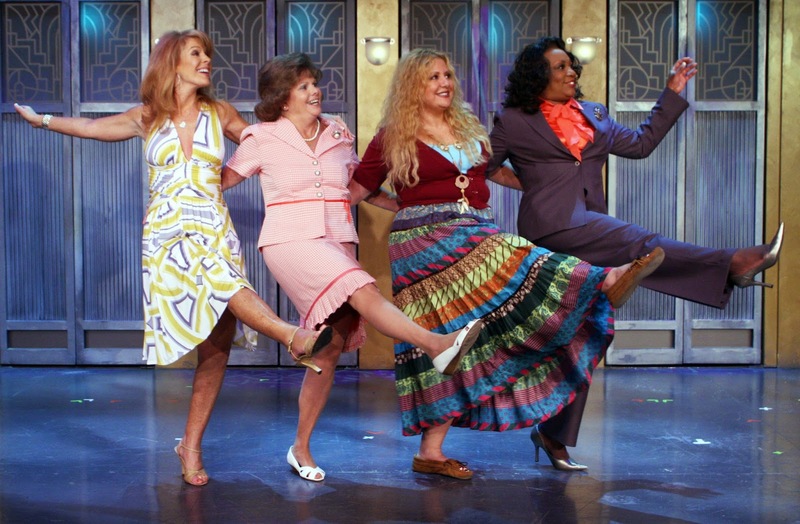 Have you ever seen Menopause, the Musical? 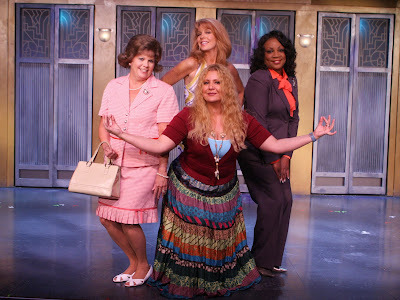 If not, you are in luck, because the hysterical musical romp through menopause is making it's way to Birmingham, Alabama and, good news, Three Friends and a Fork has four tickets to give away! That's right...FOUR! You and three of your best girls can make plans for a fun night in the Magic City. I promise you, it will be one of the most therapeutic nights of your life. 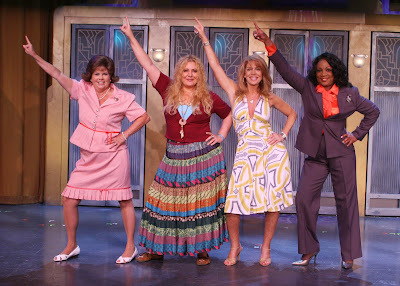 If laughter is the best medicine, Menopause the Musical is a miracle drug! Don't get me wrong, you can take your man if you like, but, unless he is a gynecologist, he is probably not going to be able to "get it" like your sisters will. A few years ago, some of my best friends and I had the opportunity to see this ingenious production and it is no exaggeration when I say that we laughed until we cried. The tale of four middle-aged, menopausal women on a shopping trip to Bloomingdale's hits all the low points of menopause in the most hilarious way possible. As the four baby boomers, the Housewife, the Soap Star, the Earth Mother and the Professional Woman, plow through the department store in search of lingerie deals, they cover everything from hot flashes to low libido. The musical numbers are even more fun because they incorporate familiar tunes with new words and meanings. For instance, the old Bee Gee's song Stayin' Alive becomes Stayin' Awake as the cast of women commiserate about the difficulties of getting a good night's sleep. The old Peter, Paul and Mary folk song, Puff the Magic Dragon becomes a side-splitting rendition of the lack of energy some menopausal women face in Puff, My God, I'm Draggin'. One of the funniest scenes in the entire play is when the ladies turnTina Turner's classic, What's Love Got to Do With It, into an insanely funny acknowledgement of the helpfulness of certain devices in dealing with lagging libido. Let's just say the "microphone" is quite a prop in this number. There are three ways to enter the contest and score tickets to a hilarious girl's night out. You have between May 13 and June 8 to enter the contest by, (1)visiting our Three Friends and a Fork Facebook page and (2) following us on Google + and/or (3) leaving us a comment below telling us where you plan to eat out in Birmingham if you win the tickets (you know, we are always wanting to hear about dining adventures). The more you do, the better your chances of winning. We have set up Rafflecopter to help us manage the whole process and we will have the name of the winner on June 8. So, good luck and mark your calendars! Our tickets are for Friday, June 12 at 8:00 pm. We can't wait to announce our winner! Three Friends and a Fork give Menopause the Musical 3 Side-Splitting Yums UP! Menopause the Musical will play the BJCC Theatre in the Birmingham-Jefferson Convention Complex (2100 Richard Arrington Jr. Blvd. North) for three shows only. Tickets are on sale now for performances on Friday, June 12 at 8 p.m. and Saturday, June 13 at 2 p.m. and 8 p.m. Tickets are available at bjcc.org,Ticketmaster.com, or by calling 800­745­3000. Groups of 10 or more can save $10 by calling (205) 458-8449. The contest is also listed at Online Sweepstakes. Looks great! My mom and aunt saw this last month and thought it was wonderful. I would LOVE to have these tix for Mom and her friends! 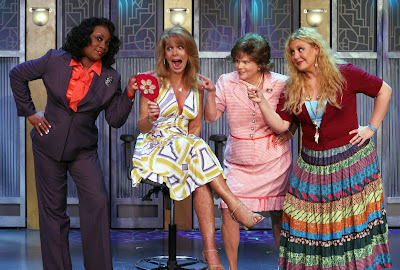 If laughter is the best medicine then I really need to see this show!! If laughter is the best medicine then I really need to see this show. I would take my girls to Mugshots for their famous burgers and good drink specials! I would take my girls to Mugshots for their famous burgers and drink specials! We would eat at the Fish Market Restaurant. I love the Fish Market, 007blond! Lakeithia Shade, I have been wanting to try Mugshots!